This Jemini Medium Back Operator Chair features a firm foam back and seat with a blue fabric covering. The fixed back design alllows the seat and back height to be adjusted for comfort for up to 5 hours usage. 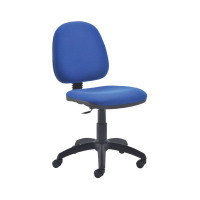 This Jemini Operator Chair sits on five castors for ease of movement. Arms available separately.